Planning even a short visit to the state renowned for its regal hospitality fills me with anticipation. So, flying in for my third sojourn in Rajasthan, my excitement is no less as I look forward to some precious me-time in the Pink City at my appointed abode for the weekend, Fairmont Jaipur. The flight lands on time, and emerging into the bright sunlight that the region is known for, I quickly settle in the cool confines of the SUV that awaits my arrival. I take in the sights of the busy-for-the-afternoon roads as we cruise on towards Riico Kukas, the area where the luxury hotel finds pride of place, nestled amongst the Aravalli Hills. The vehicle glides smoothly through the gates into the courtyard. Two ‘heartistes’ — performers who play from their hearts is how the different artistes are described at Fairmont Jaipur — belt out a rhythmic beat of welcome, infusing the moment with local flavour. As I step inside through the small door built into the bigger one, a shower of rose petals descends on my frame. I walk through another set of doors — having sashayed across the walkway that adjoins the charbagh dotted with frangipani trees — and pass a musician sitting cross-legged on a daybed. And, in the ensuing couple of days, I am witness to evening song-and-dance performances in Anjum, the tea lounge and day bar, where a young dancer gracefully pirouettes to popular tunes, finishing her performance with a pile of matkas on her head. Her dexterity in staying in step with the vibrant tunes and ensuring that the colourful pots stay in place is admirable and when I, like the other guests applaud, she smiles shyly. The initial greetings dispensed with, I am ushered to my first-floor room. I instinctively switch on the lights and spin around on my heels taking in the various facets of the Gold Room. I disregard my urge to flop down on the four-poster bed and stare out of the windows that are adorned with silk curtains. Having taken a flight out at dawn — well, almost — the desire to take a catnap does surface. But, I push that to a distant corner of my mind and soak in the rich, traditional decor instead. The bespoke residence boasts camel-bone inlaid furniture, with a distinct stone bath tub that is highly sensual and inviting. A parrot on its perch hangs from the high ceiling. Legend goes that the queens were gifted a parrot for company in the absence of the king. And they would narrate their innermost secrets and heart’s desires to the attentive birds. On the king’s return, he would take the parrot which by then was a repository of the queen’s innermost secrets. A mascot of the hotel, the bird is found in different avatars across the property. My room on the Fairmont Gold Floor showcases a seamless synergy of Rajasthani decor and state-of-the-art facilities. 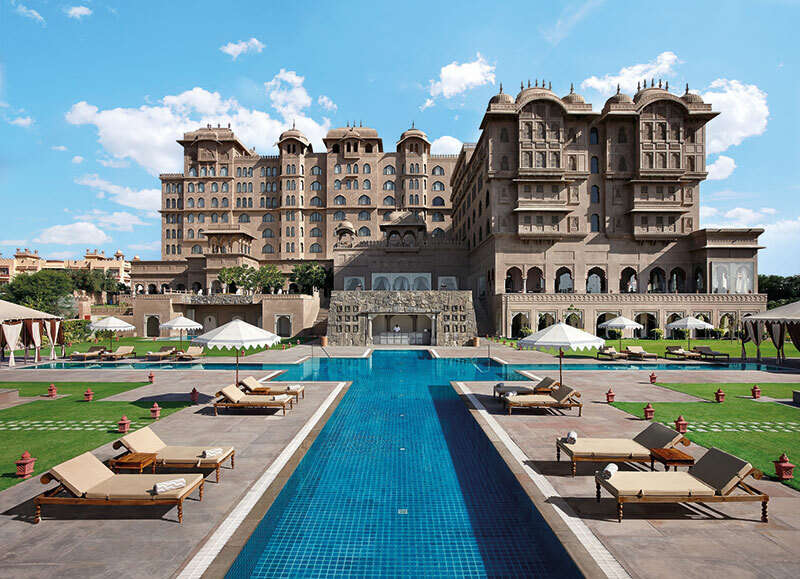 Interestingly, Fairmont Jaipur is the international brand’s first footfall in the country. 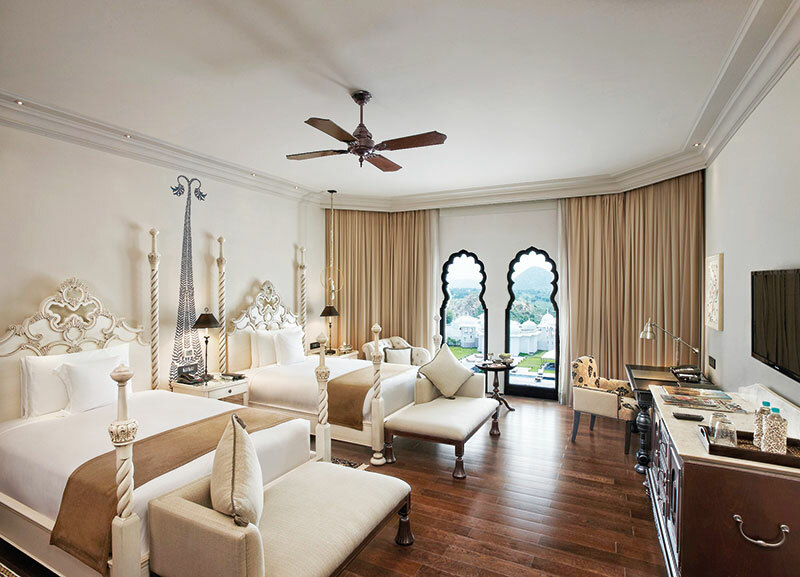 When the Fairmont Group decided to establish its presence in Jaipur — and India — its vision was to create a hotel that reflected the heritage of the Pink City. 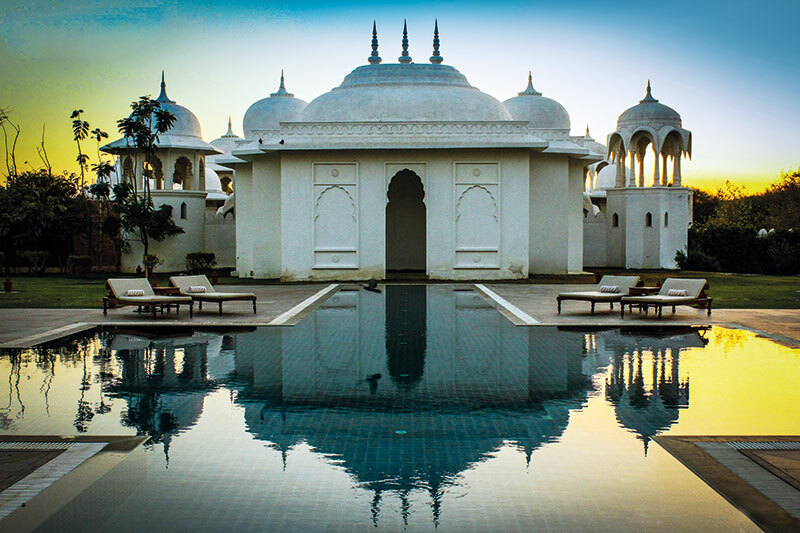 So, the plush resort, deliberately endowed with an old-world charm, was carefully designed and curated to embody Mughal elements even as it reflected the royal past of the Rajputs. Strolling around the expansive property and across its manicured landscape, my eye gets drawn willy-nilly to its different facets — doors with interesting details, dangling chandeliers, paintings on the ceilings and walls, domed pavilions and more. When a manager spots me craning my neck to look at the design on the ceilings, he tells me that the walls and ceilings have been hand-painted, adorned as they are with Rajasthani frescoes. Also, oozing local culture are the jaali screens and alcoves that have been embellished with thikri glasswork which overlook a picture-perfect view. A variety of culinary options will woo the tastebuds of even the most reluctant of eaters. And, to tell you the truth, I am more than willing to let my daily diet fly out of the window as my imagination has conjured up stylish plates filled with Rajasthani fare. I imbibe both the local fare and pan-cuisine dishes and leave the table every time unable to eat even a morsel more. So persuasive is the hospitality and so tempting are the offerings. I enjoy my leisurely breakfasts in their all-day dining restaurant, Zoya. Dinner on the first night is also here; the chef serves up melt-in-the-mouth kebabs, flavourful bhatti ka chaap (a rack of lamb that is spiced and chargrilled) and succulent desi citiwala kukkad (chicken prepared in the pressure cooker with in-house masalas). The meal concludes with gulkand ki kulfi, served on a bed of rabri. Sleep comes easily at night on a happy stomach. A day later, as I continue with my palate-pleasing indulgence, when a wedding party has checked in, the attentive staff serves me my repast in a private area of Zoya, lest I be disturbed by the band bajaa outside. Watching the guests who are celebrating the nuptials, I note with interest how the hotel takes extra care to ensure that the other residents are catered to with due diligence and speed. So, in my regal isolation I take my time dipping into the rather lavish thali that has been placed before me — filled as it is with Rajasthani delights: laal maas (a fiery Rajasthani lamb preparation smoked with cloves), gatte ki sabji (gram flour dumplings in yoghurt gravy) and dal baati choorma (whole wheat dumplings served with dal and powdered sweet whole wheat crumble), to name but three! And on another occasion, I relax in the comfort of my room to up my calorie quotient from a dabba (tiffin) that has been wheeled in for my pleasure. On the ground floor, not far from where Zoya is located, Zarin currently celebrates the fusion of Indian and Persian cuisine — but is, I am told, poised to dish up Mediterranean fare. I am served a preview of the menu that will soon unfold in this elegant space — the Zarin mixed grill (the chef’s selection of assorted charcoal grills), sheesh tawook (chargrilled chicken morsels, bell peppers marinated with garlic sauce and lemon, served with house salad and sumac vinaigrette), samak makhli (pan-seared fish with Lebanese spices, served with house salad and sumac vinaigrette) and the divine b’stilla au lait (layered filo pastry with almond cream, cinnamon, almond and pistachio). One afternoon, I lug my laptop to the Gold Lounge and spend an hour or two there catching up on work, nibbling on the canapés that are placed in front of me. On another afternoon, I head towards Aza, the Regency-style library bar, to make some more notes in undisturbed quiet. My early evenings are spent in the Anjum lounge, sipping on the various teas that are poured into my willing cup with considerable enthusiasm and explanation regarding their qualities. The icing on the cake is undoubtedly my last dinner in Fairmont Jaipur — that is laid out under the stars in a domed enclosure on the Imperial Terrace. A table for two provides for a beautifully intimate meal — and I take several pauses between my bites to admire the view that encompasses the white domed structure that is to house their Willow Stream Spa. Currently their Ruhaab Spa is in the main building — and I spend a part of one morning in its enveloping comfort, being pampered to almost every pore. I realise that it takes no effort to get used to this kind of pampering. But soon it is time to depart — and I bid adieu to my slice of living ‘queen-size’.